Putting cameras in the hands of citizens can be a powerful, even revolutionary, act. When young refugee and war-affected filmmakers in New York begin learning to tell their own stories by making documentary films with digital SLR cameras, they get a taste of the impact that media can have. But how can they learn the skills and craft of the art? One person who it tackling this challenge is Lyle Kane, the Executive Director of a non-profit organization called Reel Lives, a twenty-four-week, intensive filmmaking workshop based in NY for marginalized and at-risk youth. Reel Lives is about much more than the technicalities of filmmaking. It provides a catharsis for the young men and women who learn to use art as a medium for telling their stories and grappling with their histories. Graduates leave the program with a sense of empowerment, and with the confidence and skills to go into their communities and enact real change. 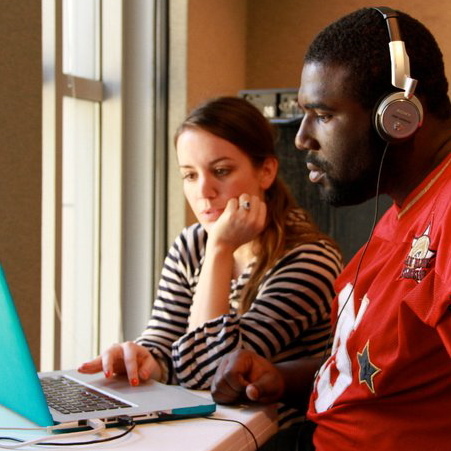 The Reel Lives intensive education combines media production, media literacy, and human rights. Teaser: NO PARKING IN BHUTAN from Reel Lives on Vimeo. 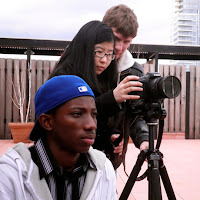 Lyle began the first program in June 2010 with a single Canon 7D EOS Digital SLR Camera, a Zoom H4n audio recorder, and six boys referred from the International Rescue Committee in NY. Their inaugural workshop was in a pizza shop on 42nd St. Soon after that Lyle acquired a grant to buy computers, and then a permanent location at The Paley Center for Media in New York. Having just completed their first year, they have acquired tripods, an impressive set of lenses, and more camera bodies. The program now uses five camera kits and five computers, and employs two and a half staff members. Post-production is done using Final Cut Pro (FCP), the PluralEyes plug-in for synchronization, and Adobe After Effects. The majority of Reel Lives students have no prior media experience and they're immersed from day one in an integrated menu of film theory, study of the documentary genre, getting hands on the equipment, and beginning to craft narrative around their chosen themes. Watching documentaries and learning to use equipment simultaneously pushes the students to develop a quick knowledge base and keeps them engaged in their own process. Their media vocabulary also develops quickly. Lyle enjoys how comments change rapidly from 'loving a film', to naming specific camera angles, rhythm, and editing styles. The students learn that lenses are as important as the camera body, and that recoding audio separately from the camera forces attention to sound quality, which can make or break a production. They also study how to make interviews and social issues visually compelling. Footage from the Canon 7Ds gets converted to Apple ProRes 422 (LT) using MPEG Streamclip. Lyle uses the analogy that the footage directly from the camera is like a rock: it can be dropped into Final Cut, but it's very hard to shape and manipulate. Transcoding to ProRes turns the rock into metal, which is more malleable. The students then name all their footage and sound, import it into FCP, assemble each interview from the 12-minute segments that the cameras allow, and then use PluralEyes to sync it up so they can begin editing. Lyle recounts, "I was a little spoiled because other filmmakers had been telling me about PluralEyes, that it's a great piece of software, that it will make life 1,000 times easier. I reached out to Singular Software and was given three licenses right off the bat. So I didn't really know life before PluralEyes. I was told it was the thing to get". Lyle says, "Especially for kids coming in that haven't done this kind of stuff before, it's literally hours and hours of work that is saved for them". Having the synchronization step handled allows the students to concentrate on turning their footage into a story. "That's the magic moment with these kids. When they're shooting they're really distracted with the whole technical end of it. But when they're sitting down and looking at the footage, they start to find the bits that are important and put it together to form the narrative. That is where the catharsis happens of these people grappling with their own stories. The plug-in allows that to be a more seamless process." Along with film education, Reel Lives students also develop pitching skills – one of a filmmaker's most valuable abilities. Six weeks in they each deliver a teaser, which they use to practice pitching as if they were seeking funding for a full documentary. They watch pitches from events at the Paley Centre, and participate in workshops to develop strong skills. Teaser: FAHISHA from Reel Lives on Vimeo. Heading into the program's second year of success, Lyle has his eye on expanding the Reel Lives offerings. 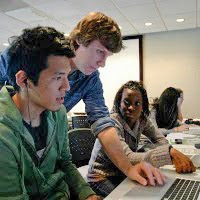 Plans include submitting the films to international film festivals so the students will have opportunities to travel with their stories; further collaboration with local organizations to focus on topics including HIV and AIDS affected youth, immigration and conflict; developing curriculum so the films can be used in local and international schools for education and outreach; and acquiring college credit for Reel Lives graduates. Reel Lives also connects the alumni with opportunities for paying work. Graduates have taken on public service announcements and videography projects on topics ranging from the NY State Dream Act to safety videos for a recycling company. With a long-term vision for the program, Lyle comments, "Eventually we'd love to go international, really do programming that works for sustainability. Go in and do a project with a group of kids, but also a training of trainers, partner with a local NGO, leave behind equipment and a group of skilled people who can then work that program in perpetuity." Teaser: My Parents Never Dance from Reel Lives on Vimeo. Lyle believes that development of a media sector in marginalized communities is essential. He points to the photojournalist Mohamed Amin whose short film about the 1984 Ethiopia famine motivated a government's response and changed millions of lives. Most of the students enroll in Reel Lives with visions of Hollywood in mind, but those quickly change when they learn the power of documentary films. "I'm a believer, I think doc filmmakers are really the new journalists. I think our students see that pretty quickly." To watch the film teasers, learn more about Reel Lives, or get involved in supporting the program, visit the Reel Lives website or Facebook page. Writer Sara McIntyre is a Communications Specialist and Filmmaker who calls Vancouver, BC 'home'.